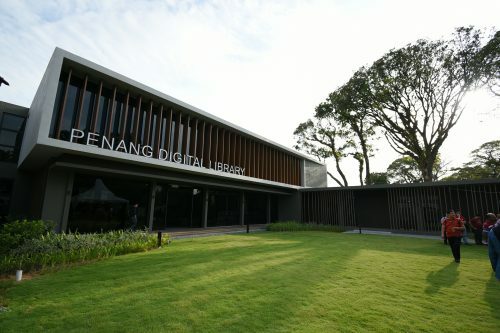 THE Penang Digital Library Phase Two (PDL-P2) is now open! The library, with a total area of about 16,000 sq ft, has been completed in December last year. The PDL-P2 is now open to public. Chief Minister Chow Kon Yeow said the opening of the PDL-P2 was in line with the state’s vision Penang2030. “The Penang government hopes to transform Penang into a model city, focusing on three main aspirations – Family, Green and Smart. “I am happy to note that all these three aspirations are ‘infused’ into the design and development of PDL-P2. “Our purpose of having the digital library is to transform the method of learning and to enable us to quickly access the information we need. “The first Penang Digital Library (PDL) is very well-received. International delegates who have visited the library have showered it with praise, calling it a model of the ‘Library of the Future’. “To date, PDL has 3,848 members who have accessed 3,024 eBooks. “The number of visitors of the PDL has exceeded its capacity,” Chow said in his speech before opening of PDL-P2 in Jalan Masjid Negeri today. Chow (fourth from left) and Lim (fourth from right) opening a mock book after the speeches. Chow said that the state was planning collaborate with the National Library of Malaysia to increase the amount of digital collection. “The collaboration will reduce the cost of the state to provide eBooks and eMagazines. “This is a form of smart networking between the state and the Federal Government, since both are under the same leadership now,” he said. Chow trying out the Bay Window Reading Area at the PDL-P2. Chow said the state has spent RM10.8 million to develop PDL-P2. The PDL-P2 was designed based on the ‘Library in the Park’ concept, where visitors can access to knowledge and information digitally in a natural environment. Finance Minister Lim Guan Eng said that having both PDL and PDL-P2 in Penang is an achievement. “It is meaningful for us to witness these successes. “I remember the times when the idea of having a digital library in Penang was mooted. It garnered a lot of interest. “After PDL was built, it continued to draw much attention. It has managed to attract so many visitors including the Princess of Thailand, who visited the digital library twice. “PDL and PDL-P2 are part of the effort to keep up with the Industry 4.0,” Lim said in his speech. Chow (second from left) opening the PDL-P2 as Lim (fourth from left) looks on. He congratulated all those who had made the digital library projects a success. Lim and Deputy Chief Minister II Prof Dr P. Ramasamy were the guests of honour. PDL-P2 is open from 8am to 10pm daily. The construction of the Butterworth Digital Library is scheduled to complete at the end of this year, while the Penang Islamic Digital Library in Scotland Road is expected to be built by middle of next year (2020).